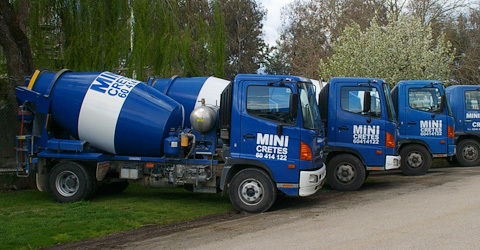 Established in 1972 Mini Cretes is locally owned and operated, servicing Albury Wodonga and surrounding areas with all your concrete needs. They also supply specialty concrete, concrete products and landscaping supplies. Mini Cretes is Albury Wodonga’s industry leader in supplying small and difficult to reach area concrete. 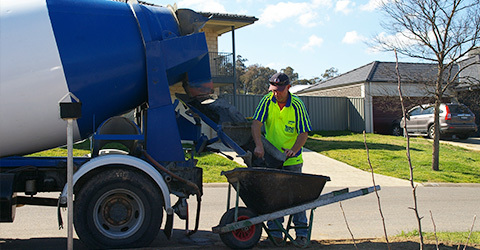 Whether you work in the construction industry or you are a homeowner doing your own renovations, Mini Cretes Albury Wodonga is locally owned and operated and is one of most established and reputable concrete suppliers in the area. No job is too big or small and we quickly and efficiently deliver 6 days a week. Our fleet of mini trucks takes the worry out of delivering concrete to difficult to reach or restricted sites. We supply standard mixes through to specialty batches with a range of coloured oxides and aggregates available. Mini Cretes Albury Wodonga is also an industry leading manufacturer of livestock water troughs and precast concrete products. Our troughs are all reinforced and vibrated using 40mpa concrete and built to last. Our range of troughs is suitable for both sheep, horses and cattle and include both rectangular and round trough designs. Not sure how much you need? Our experienced staff are just a phone call away to answer any of your concreting questions and point you in the right direction. Twelve easy to follow steps to help you complete your DIY concreting project. Alternatively phone us for support or a list of approved local concretors. to go when you are.